This particular instrument is the rarer Tangley Theatre Special Calliaphone Model CA 43 No1248, manufactured in 1926, with painted wood grain case. 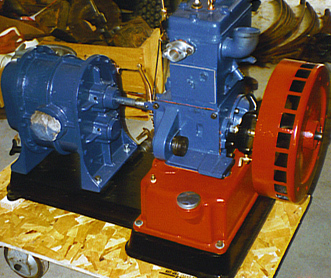 It has its original instruction sheet and also its original single cylinder Collis petrol engine and Roots type blower, on a heavy cast iron base. 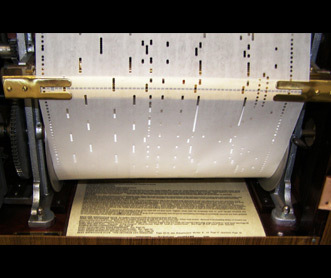 Calliaphones can be played in the normal keyboard manner but mainly operated automatically by a roll mechanism similar to that found in a player piano. The keyboard roll playing and the pneumatics that can achieve a repetition rate as high as six per second. 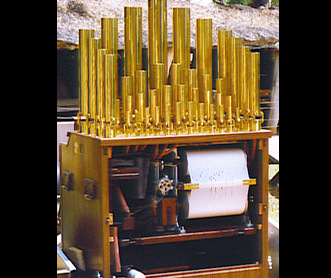 The brass pipes are called whistles and resemble train whistles rather than organ pipes in the way they operate. There are 43 notes available and so the range is somewhat limited. The Calliaphone is operated by a combination of negative and positive air pressure. The mechanical action including the roll mechanism is operated by negative pressure (vacuum), the whistles are operated by positive air pressure of about ¾ lbs per sq inch.